Onkyo SKS-HT870 7.1-Channel Home Theater Speaker System is an 8-piece speaker package that includes a 290W 10″ powered subwoofer, 2 front speakers, a center speaker, 2 mid surround and 2 surround back speakers, and all the cables and accessories you’ll need to hook them up with your receiver as soon as you get it home. The system’s 3-1/4″ woofers ensure accurate low-frequency sound reproduction of movie soundtracks, while the 1″ balanced dome tweeters handle the high frequencies. The powerful subwoofer recreates the low-frequency effects so popular in action movies. Onkyo has put together a complete 7.1-channel speaker system that you can use right out of the box – as long as you have a receiver to power them. The system also includes all the cables needed for hook-up. A 10″ powered subwoofer ensures that the low end of your home theater sound system will always be loud and clear. Crank up the bass! 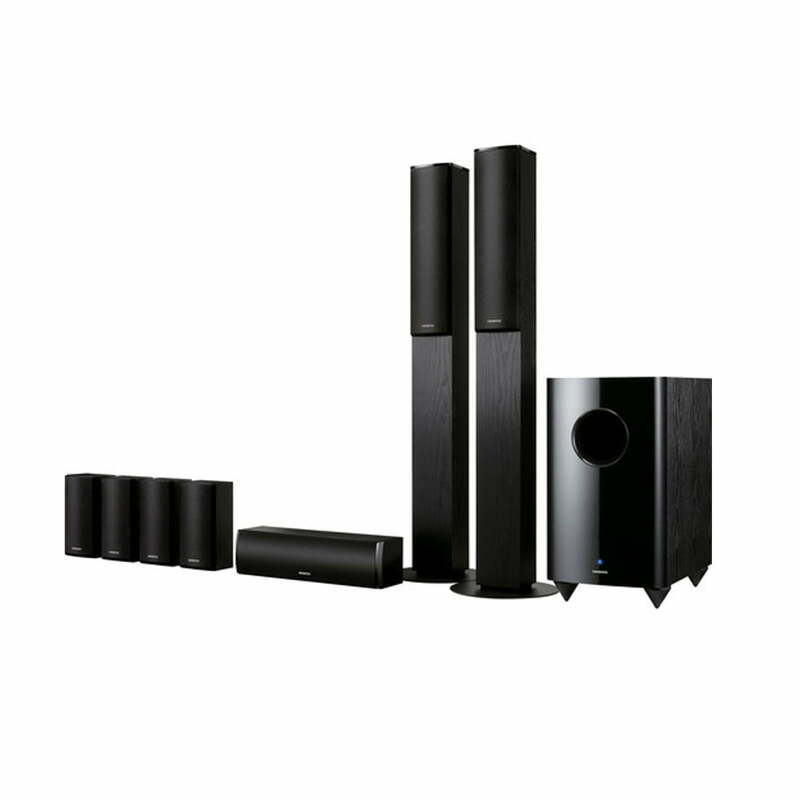 The 130W, 2-way bass-reflex front and center speakers provide the ideal soundstage for your home theater viewing. The 3-1/4″ dual woofers included in this 7.1 system’s front and center speakers provide extra lows throughout the entire sound environment. You’ll enjoy the full audio quality of your home cinema system as it was meant to be heard. The 1″ balanced dome tweeters included in this 7.1 system’s front and center speakers provide smooth highs without degradation of sound quality. Enjoy your home cinema’s high frequencies with clarity. The center and surround speakers can be wall mounted using the built-in keyhole slots. Raising these speakers closer to ear level creates a more realistic audio effect.